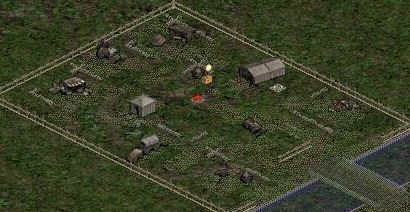 The Rogue Encampment is the starting location in Diablo II, where you undertake your goal of attempting to catch up with Diablo while having the goal to get Diablo 2 Items before he frees his brothers and Hell is unleashed on Sanctuary as the Prophecy foretells. The Rogue Encampment is a makeshift town located right next to the Blood Moor. As its name designates, it is the camp set up by the survivors of the battle at the Rogue Monastery. The Rogue Monastery was attacked by the forces of Hell in an effort by Diablo to create a stronghold on Sanctuary against the forces of Heaven, and destroy opposing mortals, as the Sisters of the Sightless Eye had. Many rogues died or were corrupted by the evil and started roaming the countryside along with other tainted creatures and demons. Such rogues include Bloodraven (the Rogue heroine from Diablo I), Coldcrow and Andariel (who took over the body of a Rogue and transformed). Flavie – One of the elite scouts (Located at the entrance to the Cold Plains). The following quest is available for this area which can be rewarding for your D2 Items hunter if completed. This zone can be the place where you can grind items as you gain level.